Rosa Louise Parks (born February 4, 1913 as Rosa Louise McCauley) is a retired African-American seamstress and figure in the American Civil Rights Movement, most famous for her refusal in 1955 to give up a bus seat to a white man who was getting on the bus. Rosa Parks was born in Tuskegee, Alabama, daughter of James and Loeona McCauley. She grew up on a farm with her grandparents, mother, and brother; for most of her adult life she worked as a seamstress. In the early 1950s, Parks became active in the American Civil Rights Movement and worked as a secretary for the Montgomery, Alabama branch of the NAACP. Just six months before her arrest, she had attended the Highlander Folk School, an education center for workers' rights and racial equality. On December 1, 1955, in Montgomery, Parks refused to obey a public bus driver's orders to move to the back of the bus to make extra seats for whites. Rosa was tired of being treated as a second-class citizen and stood firmly. She was arrested, tried, and convicted for disorderly conduct and for violating a local ordinance. The very next night, 50 leaders of the African-American community, headed by a relatively unknown minister (Martin Luther King, Jr.) gathered to discuss the proper actions to be taken after Mrs. Parks' arrest. What ensued next was the Montgomery Bus Boycott. The entire black community boycotted public buses for 381 days. Dozens of public buses stood idle for months until the law legalizing segregation in public buses was lifted. This event helped spark many other protests against segregation. In helping in this boycott, Rosa Parks helped make her fellow Americans aware of the history of the civil rights struggle. In 1956 Parks's case ultimately resulted in United States Supreme Court's ruling that segregated bus service was unconstitutional. Afterwards, Parks became an icon of the civil rights movement. She moved to Detroit in the early 1960s and served on the staff of U. S. Representative John Conyers (D-Michigan) from 1965 until 1988. She continues to reside in Detroit. While few historians doubt Parks' contribution to the civil rights movement or the bravery of her refusal, some have questioned some of the more mythic elements of her story. Standard accounts of Parks' act of civil disobedience in 1955 refer to her simply as a "tired seamstress." Parks stated in her autobiography, My Story, that it was not true that she was physically tired but was "tired of giving in." Also, some accounts downplay her prior involvement with the NAACP and the Highlander Folk School, portraying her as an individual with no particular political background or training. Many accounts fail to clarify: she was sitting in the "colored" section of the bus. With the "white" section full, a white man wanted her to give up her seat. That is, it was not a matter of protest on any level when she sat down; the protest was in her refusal to give up a seat in the "colored" section. Parks was not the first African American to refuse to give up her seat to a white person. The NAACP accepted and litigated other cases before, such as that of Irene Morgan, ten years earlier, which resulted in a victory in the Supreme Court on Commerce Clause grounds. That victory only overturned state segregation laws as applied to actual travel in interstate commerce, such as interstate bus travel. 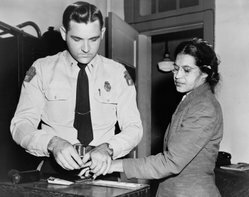 The Rosa Parks case is considered the landmark because it applied to all segregationist laws, not just those affecting interstate commerce. Jackie Robinson took a similar, but less-well-known, stand while an Army officer in 1944 in Fort Hood, Texas, refusing to move to the back of a bus. He was brought before a court martial, which acquitted him. The NAACP had additionally considered but rejected some earlier protesters deemed unable or unsuitable to withstand the pressure of a legal challenge to segregation laws (see Claudette Colvin and Mary Louise Smith). The selection of Parks for a test case supported by the NAACP has been speculated to be in part because she was employed by the NAACP. A scene in the 2002 film Barbershop, where characters discuss earlier instances of African-Americans refusing to give up their bus seats, caused activists Jesse Jackson and Al Sharpton to launch a boycott against the film. 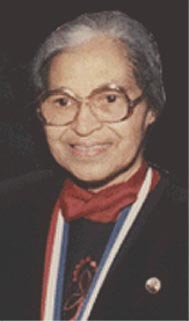 Rosa Parks was inducted into the Michigan Women's Hall of Fame for her achievements in civil rights in 1983. After a lifetime of activity fighting racism, Parks was awarded the Congressional Gold Medal in 1999. The Rosa Parks Library and Museum in Montgomery, Alabama, was dedicated to her in November 2001. It tells the story of the events leading up to her historic act of civil disobedience, and how her simple act connects to the larger tapestry of the civil rights movement. Rosa Parks is often and has been called the "mother of the civil rights movement" and one of the most important citizens of the 20th century. She is also considered a living symbol of courage and determination and inspiration to freedom-loving people everywhere. In 1994, Rosa Parks was attacked and mugged in her Detroit home by Joseph Skipper. She had a total of $53 stolen from her. The incident created outrage throughout America after Parks admitted she had asked Skipper "Do you know who I am?" Before beating her, Skipper (an African American, himself) was reported to have stated he did know who Rosa Parks was but didn't care. In 1999, Parks's lawyer sued hip hop band OutKast for using her name in the song "Rosa Parks" from the album Aquemini. The initial lawsuit was dismissed. Parks' caretakers hired lawyer Johnnie Cochran to appeal the decision in 2001, but this too was denied, on First Amendment grounds. In 2003, the Supreme Court allowed Parks' lawyers to proceed with her lawsuit against OutKast. In 2004, the judge in the case appointed an impartial representative for Parks after her family expressed concerns that her caretakers and her lawyers were pursuing the case based on their own financial interest. "My auntie would never, ever go to this length to hurt some young artists trying to make it in the world," Parks' niece, Rhea McCauley, said in an Associated Press interview. "As a family, our fear is that during her last days Auntie Rosa will be surrounded by strangers trying to make money off of her name." OutKast was dismissed from the suit once and for all that August. Parks' attorneys and caretaker refiled and named BMG, Arista Records and LaFace Records as the defendants, asking for $5 billion in damages. The lawsuit was settled on April 15, 2005. In the settlement agreement, OutKast and their producers and record labels agreed to work with the Rosa and Raymond Parks Institute for Self Development in creating educational programs on the life of Rosa Parks. The record labels and OutKast did not have to admit any wrongdoing.